by Meg Blackburn Losey, PH.D. 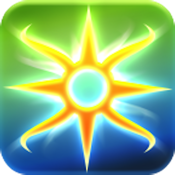 The Living Light Cards can be used for guidance, divination and even healing. Includes a Major Arcana for spiritual guidance alone, and a Minor Arcana that when used with the Major Arcana, can be used for full divination of information and self Mastery. Within the deck is a third set of symbols that can be used for basic harmonization of the energy field as well as the front and back of the body. No previous experience necessary the ap does it all for you! Choose from multiple layouts or even a quick one card question or use the card of the day for daily guidance! These cards are powerful sets of energy that are sure to change the way we see ourselves and our journeys. Love, Love,Love…......These cards are one of my favorite decks and I have lots in my collection. Every reading has been very insightful and right on target. I absolutely love this deck!